You are so excited! You have picked out and purchased your new aquarium, set up and tested the equipment, started up the system, and if you are NOT cycling the tank with live rock, you are now ready to add some fish to get things going. You think to yourself, what am I going to put in it? You recall that you really liked that fish you saw in the store the other day, ya know, the one that had all the bright colors. You remember it was so beautiful and very expensive, and at this point, you ask yourself, do I really want to spend $70.00 on a new fish? The answer to this question, of course, should be, no. Aside from being new to the hobby and having much yet to learn, for you to go out on a limb and spend this kind of money for a fish to put into a newly started aquarium is absurd, and don't let your local fish store talk you into it either. If you did your homework prior to starting your new aquarium, you know that the cycling period your tank has to go through to settle in results in high levels of ammonia and nitrites that are toxic to fish as well as all other livestock until the process completes its mission of establishing the biological filter base in the aquarium. Considering the threats that loom ahead for any fish for the first 30 days or so, including your lack of experience, why would anyone want to put this kind of money into a fish to cycle a tank with? First of all, do not buy and introduce sensitive invertebrates or corals into the tank at any time during the cycling process. When it comes to selecting starter fishes, as well as other livestock for the future, plan ahead and prepare a "species list", then learn as much as you can about each animal's characteristics, dietary requirements, feeding habits and captive care, BEFORE buying anything! Using the measurement of approximately two inches of fish per 10 gallons of tank water rule of thumb can give you a general idea of how many fish to add. 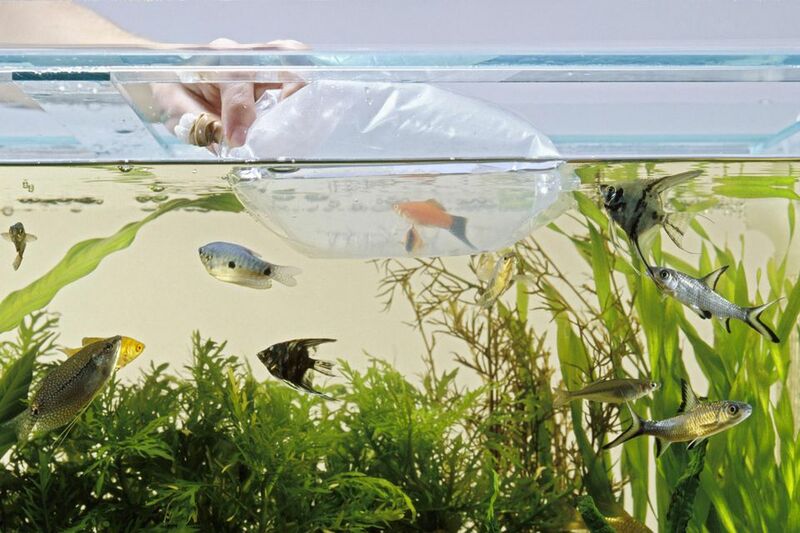 Buy inexpensive, durable, hardy fish that are known to do well during the tank cycling process. Some of the best fish to start an aquarium with are Damsels or Chromis', members of the Family Pomacentridae. Now we know some of you are going to say, but these fish are so plain looking and can be very aggressive. Yes, they can be, but once the tank has cycled and allowed to run for a month or so after that, you can trade them in at your local fish store or give them to someone else who may be starting a new tank. THEN you can step up to one or two of the more elegant beginner fishes for aquarists in the intermediate care range. Know what to look for when buying fish. The quality of the animals plays a vital role in your success with their care. Did you know there are ways to speed up the nitrogen cycling process to help aid in the completion of the cycle and shorten the time fish are exposed to the high toxic levels of ammonia and nitrites during the process? During the cycling period, test your tank water chemistry on a regular basis for ammonia, nitrite and nitrate levels. The most dangerous toxin that will naturally appear in your tank is ammonia which is created by fish waste and uneaten food. When the ammonia levels start getting a bit high, you can either perform a partial water change or treat the tank with an ammonia neutralizer to bring the levels back down into the safe zone. In order for the cycle to complete, there must always be a small amount of ammonia in the tank water, so do not continuously keep the ammonia level at zero.